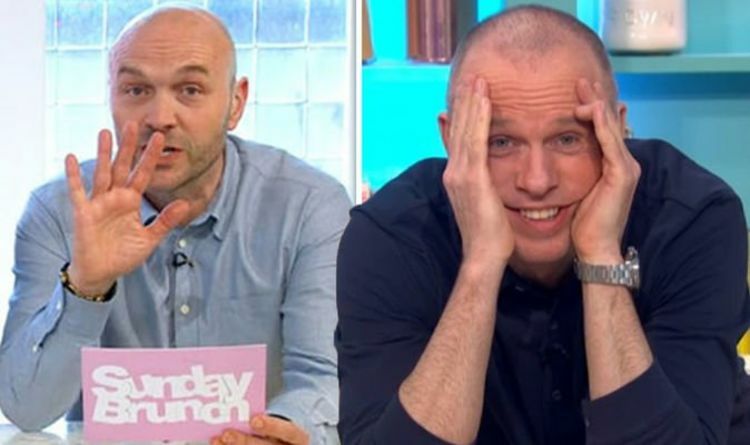 After Fleabag actress Sian Clifford accidentally let slip a very rude word earlier in the show, Tim Lovejoy, 50, and Simon Rimmer, 55, were already on edge during today’s instalment of the Channel 4 programme. Things took a turn for the worse for the Sunday Brunch presenters when they sat down to interview Keith Lemon, real name Leigh Francis, 45. The Celebrity Juice favourite took great delight in teasing the pair by shouting words which sounded as if he was about to turn the air blue as they chatted about the time Tim and Simon appeared on the comedy panel show. “You made us swear on tele,” Simon remembered. “What did you say?” Keith quipped cheekily, trying to make them swear live on air. “We were so rubbish at it, I was very uncomfortable,” Simon continued, ignoring the comment as he tried to keep the show on track. “Did you say FUN? !” Keith shouted, causing Tim to clutch his chest in shock as he groaned, while Simon held his head in his hands. “Did you say SHINE? Did you say PEAS?” Keith added, emphasising the beginning of the words to make it sound as though he was about to swear each time. “Let’s have a look at a clip!” the pair exclaimed in unison, gesturing wildly to the crew in panic. They ended up collapsed on the sofa, looking relieved Keith had stopped teasing them. The Sunday Brunch stars’ nerves were clearly shredded by the end of the segment, while Keith joked they needed to soldier on, saying he was filling the silence because they were leaving a stunned “dead air”.